This thread on a German RR forum was pointed out to me Pat (Belg). It describes an option/alternative to using/buying the Silfor and sim. gras clumps and strips. Basically what he is doing is using a baking pan/tray laying down some spots/lines/puddles of glue, attaching the electric/charging leads from a static-grass gun/blower to the tray (so that means the tray cannot be aluminum since AL doesn?t conduct well), and shooting the static grass down onto the tray/glue-spots. 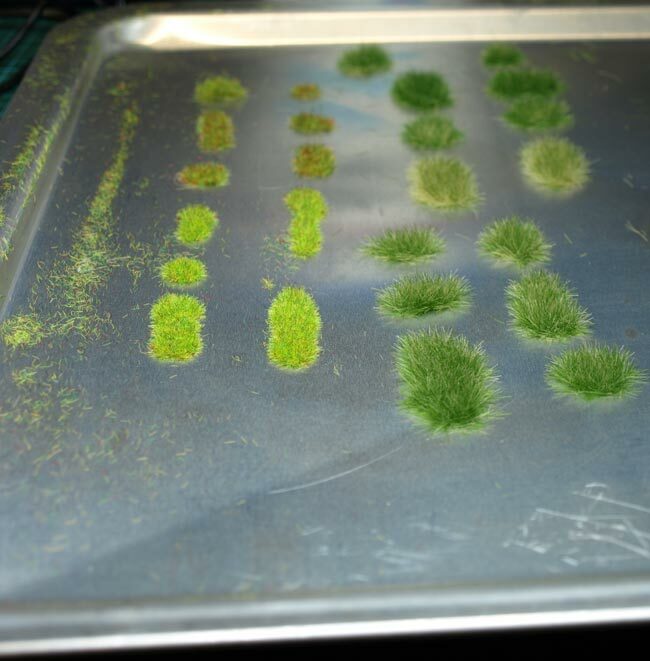 When dry, the grass covered glue is then easily lifted/removed/pried from the tray. Here is a linked pic. of his result.